We want to make sure your purchasing or building process is as easy as pie. Therefore, our staff has developed a list of questions that are commonly asked while researching your fire pit needs. If you can't find the answer to your question, please feel free to call us at anytime at 1-877-743-2269! Who can install my fire pit? What should I build my fire pit out of? What types of ignitions are there? 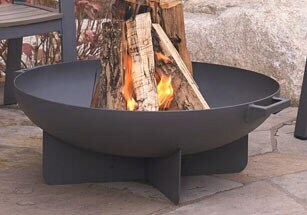 Can I burn wood in my gas fire pit? Can I use my gas fire pit inside? Can I cook on my gas fire pit? What is the best way to choose my burner ring size? When should I have a pan under the burner? How does the burner balance on top of the gas line? How big does my gas line need to be? Why does my gas fire pit make a whistling sound? Should I use pea gravel or sand as filler? What is fire pit media? How much lava rock do I need? Does fire pit glass ever burn or fade? Can I use natural river rock in my fire pit? Do you install the burner ring facing up or down? Is there ever clean up or maintenance required? What is a venturi or air mixer? What is CSA certified and what does that mean to me? Will the wind affect the flame on my gas fire pit? How long are the warranties for fire pits on BBQ Guys? By definition, a fire pit is a hole designed to contain a fire and to prevent it from spreading. Fire pits are also a decorative accessory for your outdoor living area to provide beauty, warmth and ambiance. 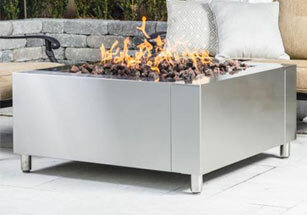 The fire pits we offer are available in wood, gas and propane burning styles as well as different shapes such as round, hexagon, octagon, pentagon, rectangle and square. Licensed plumbers or professional gas installers should be resources used for installing your fire pit. There are safety risks involved with installing gas products as well as local codes that have to be taken into account. Fire pits can be built using concrete blocks, bricks, or stone pavers. The key here is to build it out of non-combustible materials. Match Light, Manual safety pilot, and Remote Control with Electronic Ignitions. No. The intense heat generated by a wood burning fire could damage your fire pit. If you want to burn wood, look into getting a wood burning fire pit. No. Gas fire pits cannot be used in any enclosed area. Cooking on your gas fire pit is not recommended. The grease or drippings from your food will clog the burner and give your media a dirty appearance. 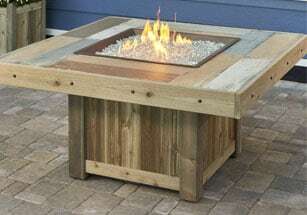 Fire pits also burn a bright yellow flame for appearance and yellow flames produce soot and smoke. They don’t soot up your media too much because the bottom, blue-er portion of the flame is what’s touching them. The tops of the flames, though, the parts that would be cooking your food, would produce a heavy sooty covering on what you’re cooking. If you want to cook on a fire pit, we recommend looking into a fire pit grill which use wood instead of gas. We recommend that you get a fire pit ring that is 6" smaller than the inside diameter of your fire pit. For instance, if your inside diameter is 42", you will need a 30" fire pit ring. This will allow for a safe distance from the edge of the fire pit, as well as help to maintain an aesthetically pleasing look. For natural gas, having a pan under the burner isn't necessary but it is recommended. A pan keeps excessive debris from potentially clogging the burner nozzles, adds extra support for the burner and it also makes it easy to access the gas line for inspection. Another benefit is that it cuts down the amount of medium you have to buy because the pan supports the gas line which means that you won't have the fill the bottom of the pit with gravel to hold the pipe up. For propane, a burner pan is necessary because an air mixer is required to ensure a clean and safe burn. A pan will provide adequate space for the air mixer to function. The burner gets its support from a pan, a collar, or by sitting directly on the rocks. The size of the gas line depends on the gas pressure, size of the fire pit, length of run, and max btu/h rating of the burner. The more gas the burner puts out, the bigger your line needs to be. If you are unsure what size gas line you should use, contact a professional contractor to assist you. Usually that annoying whistling sound is caused by the flex line. Make sure that it is routed where there are no major bends or kinks in the line. Whistle Free Flex Lines are also preferred. If you have determined that your flex line isn't the issue, the next thing to look at would be the gas supply pressure. We recommend that you call in a professional to check the pressure and make necessary adjustments. Pea gravel is recommended as filler. Sand retains moisture, which could cause your fire ring to rust or corrode much sooner and when wet, sand will clog the holes in your fire ring. How long it will last will depend on the btu/h of the burner. A full 20lb tank has approximately 430,000 btu/h worth of gas. A fire ring that is 18” or smaller is recommended with a 20lb tank. Fire pit media is what is used to fill your fire pit and give it the look that you desire. Media types include: decorative fire glass, lava rocks, fire pit stones, mixed media, and fire pit logs. To find out how much glass you need in your fire pit, simply measure the dimensions and then use our handy fire glass calculator. If you use a pan, measure the depth of the pan only. If you are not using a pan, then you will to measure from the top of the filler. 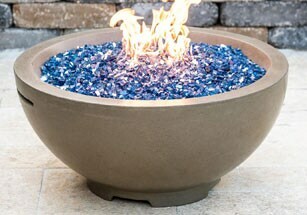 The bottom of the fire pit is usually filled with a cheaper material like pea gravel or lava rocks with about two inches of fire glass on top. The amount of lava rock you need depends on the size of your fire pit. Lava rock can be difficult to calculate because the rocks vary in size. When installed and used properly, fire glass will never burn, melt or discolor. Reflective fire glass has a reflective coating on one side which creates a mesmerizing effect. Non-reflective fire glass is uniform in color on all sides without the reflective coating. If you want to see side-by-side comparisons, see our page about Reflective vs Non-Reflective Fire Glass. Absolutely not! Never use stones or rocks that you've collected. These stones have moisture content in the rock which will cause the rock to explode when heated. It is important to use stones that have been designated as heat resistant, such as our fire pit stones. We suggest that you install it with the holes pointing upward so that you will get a larger flame more effectively. Another benefit is that you will get more heat pointing the holes upward. When it is pointed down, the heat flows into the base of the fire pit, which could damage the fire pit over time. The maintenance on a gas fire pit is minimal. The burner will need to be cleaned and occasionally cleared of any obstructions. If using fire glass, it will need to be cleaned of any soot which can be done with soap and clean water. Propane gas must be mixed with air to ensure a clean and safe burn. The venturi / air mixer allows this to happen. CSA stands for Canadian Standards Association, which is a nationally recognized testing laboratory that certifies a product is safe, reliable and functions as advertised. Certification also requires that any ignition methods be pre-installed at the factory for testing. The wind can certainly affect the flame. It can blow it to the side and make it harder to see. If the wind is strong enough to blow out the flame, you should not use the fire pit until the winds die down. If the wind is a concern, look into a wind guard for your fire pit. To compare warranty information on our fire pits, consult our fire pit warranty charts. For detailed warranty information, please see user manuals.